The 2017 Four Continents Championship served as a unique test for both event coordinators and competitors of how the 2018 Olympic Games in PyeongChang will unfold. For skaters it presented a powerful opportunity to gauge their mental and physical preparation for the Olympics as well as to experience an atmosphere unlike any other. It certainly was a Cinderella story for Japan’s Mai Mihara who came back from a fourth place short program to win the gold medal in Gangneung. Mihara, the Japanese national bronze medalist, skated to the music of the 2015 Disney live-action Cinderella movie and used it to propel her to victory. After a short program where not even the top skaters skated completely cleanly, Mihara’s clean free skate was a welcome respite and included a beautiful triple Lutz-triple toeloop combination and seven total triple jumps. Though the 17 year-old lost points in the component score, her technical score helped push her to a total competition score of 200.85 points, which represented a personal best combined total and free skate score, securing her first major international victory. Though she fell from first after the short program to second after the free skate, Canada’s Gabrielle Daleman’s silver medal was nevertheless a huge personal victory after a season where she finished just off the podium in both her Grand Prix assignments. The Canadian silver medalist skated to the classic “Rhapsody in Blue” by George Gershwin and despite a few small errors including executing a single loop instead of a triple, she was still able to hold on to a second place finish, her highest finish at any international event so far in her career. Daleman’s combined score for the competition was 196.91 points, a new personal best for her. For the second season in a row, Mirai Nagasu won the pewter medal at the U.S. National Championships and for the second season in a row she medaled at Four Continents, this year taking home the bronze in place of silver the year before. Nagasu’s total competition score was 194.95 points, another personal best, and she was able to capitalize on the opportunity to represent Team USA in Gangneung even though she will not be on the World Championship team headed to Finland in March. It was a difficult day for both Mariah Bell and Karen Chen, who finished in 6th and 12th place respectively. 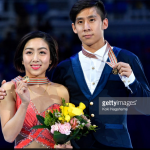 Several step outs and a fall for Bell and no triple-triple combination for Chen made it challenging for both of them to make up ground in the standings. Bell finished the competition with a score of 177.10 points while Chen accumulated 166.82 points. 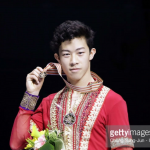 Chen, Bell and Ashley Wagner will be representing the United States in Helsinki, Finland at the World Championships, which will begin on March 29th.